As our Benchmark Foam customers continue to grow in new markets and regions, some of our manufacturing processes have altered to meet new needs. With stricter regulations in certain areas, contractors must use termite treated products to protect the homeowner and property occupants. Because of the excessive amount of termites in some regions, including the invasive Formosan species, Benchmark Foam opted for an insecticide treatment rather than a termite repellent formula. The non-toxic treatment is registered with the Environmental Protection Agency as safe to handle and is highly effective at low concentrations. The formula used in Benchmark Foam’s termite treated products acts to kill insects instead of merely repelling them. Termites die before they are able to cause additional damage. 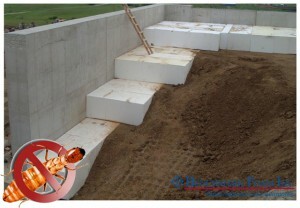 While most commonly used in SIPs Structural Insulated Panels and geofoam, any of Benchmark Foam’s products can be produced with the termite treatment. For more information on termite treated products, call our sales team at 800-658-3444 or 605-886-8084.